Walking down the bazaar (souk) in the Middle East, your eyes will light up with joy. There is just something about the marketplace and how lively it is. 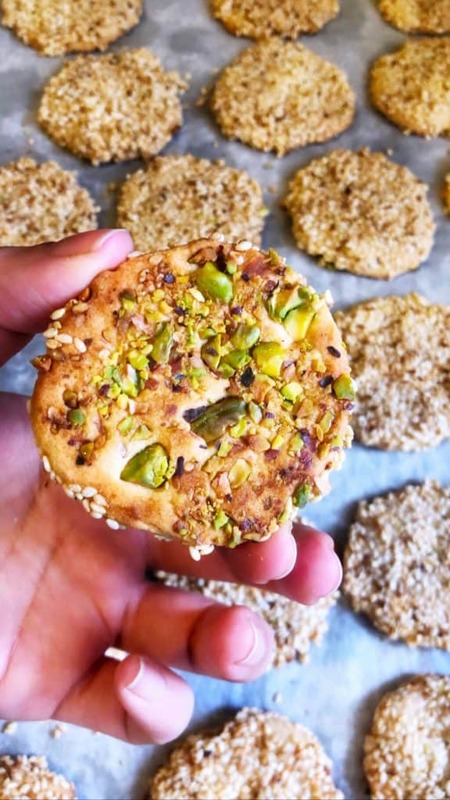 One of my favorite memories is stopping by a stand stacked with these thin, crisp, and slightly sweet sesame seed cookies with pistachios. I never was one to like sweets so I assumed that I wouldn’t like these cookies but it was love at first bite. 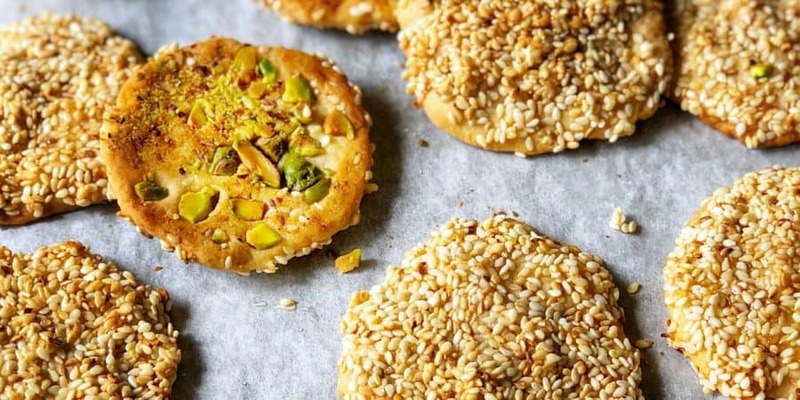 The nuttiness of the pistachios and sesame seeds with the slight hint of sweetness was just perfect for me. I have been wanting to make these for so long but always hesitate thinking no way I can make it as good. Even though, these aren’t perfect; they definitely reminded me of those memories. They are worth sharing and trying! In a pan, saute the sesame seeds until they are lightly browned and set aside in a shallow pan mixed with the simple syrup. In another shallow pan, add the crushed pistachios. Set aside. In a bowl, mix together the yeast and warm milk. Set aside. In a large bowl, using the paddle attachment or a spatula cream together the butter and powdered sugar. To that, add the flour in 1 cup at a time. Mixing it together. Now, add the yeast milk mixture and keep mixing until it comes together like a dough. Dough will be slightly sticky but manageable. Take a teaspoon of the dough and shape into a ball. Use your hands or palm to flatten the dough. Then press the dough down into the sesame seed mixture coating one side completely. Dip the other side into the pistachios. This doesn’t have to be covered completely; just a few pistachios on the back is great. If you don’t have simple syrup on hand, you can easily make it. Just mix 1/2 cup water with 1 cup of white sugar and a squeeze of lemon juice in a small pot and bring that to a boil on medium heat. Stir it consistently until it starts to thicken. Then allow it to cool to room temperature. Store leftover in a container in the fridge; it will thicken slightly there as well. Place cookie on parchment lined baking sheet sesame seed side up. Bake for 20-25 min on 335 F. The bottom should be lightly browned. Broil for a minute until browned lightly on top as well. Set aside to cool completely so it crisps and then store them room temperature in a dry place in an airtight container.